I love the month of May …. Must be a hangover from my little girl days – I would wake up on my birthday to find an array of prezzies at the foot of my bed. Even though May now means I’m another year into my nearly dotage my enthusiasm for gifts has not abated despite the fact that I buy a lot of prezzies BY me for MYSELF – this birthday 2 fab pairs of shoes! I also treated myself to the old Stellenbosch Hydro (haven’t been there for years) … It’s been upgraded and it was such a joy to be there with my friend Leora. 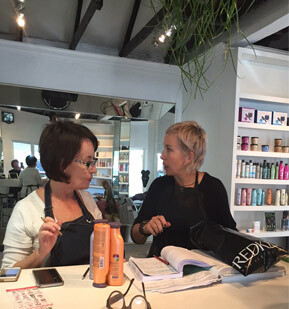 best discovery this trip was a hairdresser by the name of Michelle Hobkirk of Snapdragon (lunartic@iafrica.com) – brilliant, talented, warm – she just gets you! One Teaspoon Spotted on Algria the coolest face painter in Cape Town…I fell in love and had to have. Toni&Savannah What could be more luxurious-with-a-sporty-edge than our yummy Toni&Savannah pure cashmere pj’s……for keeping toasty and trending it. Lemonade by Beyoncé a couple of times a day – I’m obsessed – it’s a collaborative feast of poetry, politics and sheer raw honesty. If you’ve ever been wronged by a man (and who hasn’t??) this album will have you relating. Available on Tidal, iTunes or Amazon. A visual smorgasbord.